CEREC Crowns Sioux City IA | New porcelain dental crowns made during a single visit! Until recently, having a tooth repaired with a crown took a number of weeks and multiple steps. First, there was the initial visit for the temporary and casting impressions. Then there was a long wait while another lab shaped the permanent crown. Then a second, follow-up visit ensued for your dentist to place the crown. If it didn’t fit correctly, then the entire process began again. Fortunately, there have been amazing improvements in technology. Instead of a multi-week timeframe, in roughly one hour you can have your new permanent crown placed in your mouth. 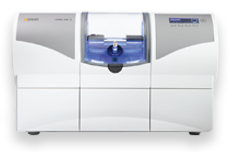 With CEREC computer-aided design and milling, the fit will be impeccable, the crown will be long-lasting, and the exceptionally natural appearance will simulate the look of an original tooth. Dr. Salmons’ patients love this new method. The process is both simple and amazing. With a special camera, a detailed image is taken and presented on our computer screen. We then model the restoration and CEREC produces the crown. Next, we insert and bond the restoration to your tooth. Like our other patients, you will be ecstatic about how easy this is! At last, a great-fitting replacement, an esthetic alternative to silver or plastic fillings, and all without nasty, goopy impressions or an extended wait. Call us today and schedule your new crown. There’s no charge to learn more about CEREC one-visit crowns. Call today at (712) 239-5900 to schedule your complimentary consultation.